Today we are excited to announce the general availability of Azure Monitor, Microsoft’s built-in platform monitoring service for Azure. As you create your workloads in Azure the essential monitoring capabilities are available without any need for manual configuration or purchase of additional tools, enabling a seamless movement to the cloud. Azure Monitor provides you all the vital monitoring telemetry including platform- and service-level metrics and logs, gives you the ability to configure alerts to take intelligent actions on that data, and empowers you to unlock deeper insights and analytics on top of the telemetry through seamless integration with your preferred advanced monitoring solutions. Azure monitor comes with REST APIs, Resource Manager templates, PowerShell cmdlets and Azure CLI support, enabling flexibility in how you consume and configure monitoring capabilities. We are excited to see the growth and adoption of Azure Monitor among customers and partners alike since preview. We want to take a moment to acknowledge your continued support and feedback and share stories about how our customers and partners are responding to the service. New Zealand based Theta Systems Ltd is a premier consulting service that provides Azure-based solutions to many of their clients. The DevOps team at Theta uses Azure Monitor as their first line of defense for everything related to monitoring. Theta Systems seeks to maintain highly available services on the Azure cloud, which requires them to get immediate notification of any incident whether the source is poor performance of an individual resource, a change to an Azure subscription, or even a service health incident from Azure. 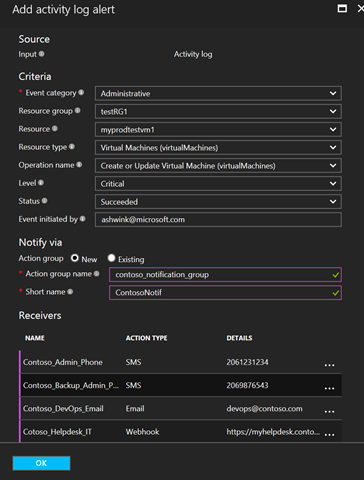 While our existing metric-based alerts have allowed you to become aware of issues in your infrastructure and take automated action using email and webhooks, many of you wanted to create alerts on Activity Log events to do the same for events such as VM reboot, deployment failure, or user permission change. Today we are excited to announce two new features, also now generally available, that help you with just that: Reusable “Action Groups” for managing lists of alert “receivers” and Activity Log Alerts. 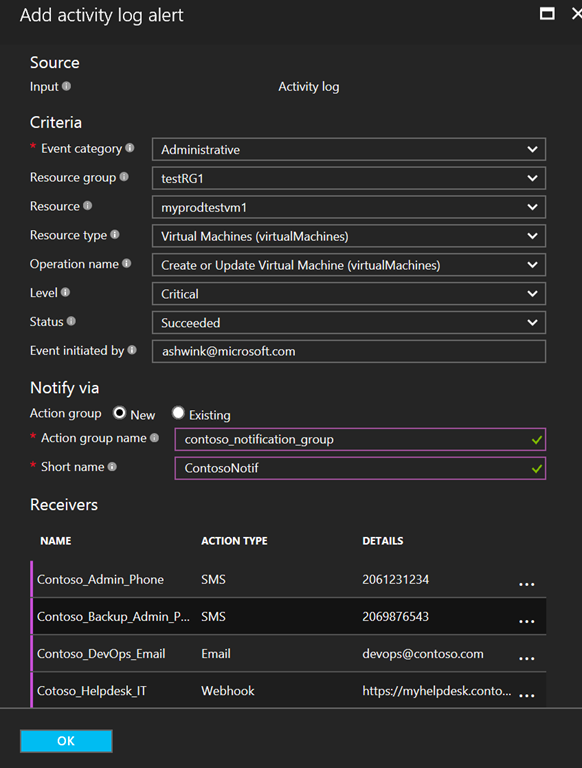 These flexible new tools enable a wide range of options for alerting, including the ability to have your operations team receive an SMS when events such as an Azure service health incident, a deployment failure, or an autoscale event occur. To learn more about these new features, please visit our documentation. Fig 1. A pre-populated view of an Activity Log alert with Action Group and Action Types. Rackspace’s Microsoft Cloud team provides Fanatical Support for Azure, delivering expert-level monitoring and management support for their customers’ workloads on Azure. The support team at Rackspace leverages resource- and platform-level telemetry from Azure Monitor in conjunction with rich operational insights from Azure Log Analytics, available as part of Microsoft Operations Management Suite, to perform end-to-end monitoring and troubleshooting for their customers. As you continue to grow your footprint in Azure, you need scalable monitoring solutions to gain deep insights and take intelligent actions promptly. With platform-level telemetry from Azure Monitor, application-level telemetry from Application Insights and the ability to seamlessly analyze, search and alert across all that data in Azure Log Analytics, customers can unlock a holistic end-to-end monitoring and management experience all within the Azure portal. Azure Monitor also goes beyond completing Microsoft’s holistic monitoring experience to provide simple and powerful integration points for a growing number of partner tools. Azure customers use a variety of services to meet their individual needs, and we work closely with many of them to enable high-quality experience for Azure in their solutions. Datadog Inc is one such partner offering a single pane of glass for monitoring infrastructure and has been continuously boosting their Azure integration & support using Azure Monitor. "The Azure Monitor API allows our customers to gain insights across the various Azure services they are running. Once their Azure telemetry arrives in Datadog, customers take advantage of interactive dashboards, alerts, collaborative troubleshooting and integrated application monitoring experiences among other capabilities," said Amit Agarwal, Chief Product Officer at Datadog. " We've seen the tremendous adoption of the Azure platform amongst our enterprise customers over the past year." Our full list of partners integrating with Azure Monitor today is available here. We’re committed to building an open ecosystem of partners to deliver the best monitoring experiences for Azure customers, so we invite you to give us feedback on the tools most important to have integrated with Azure Monitor using this brief survey. We are excited to see the tremendous adoption of Azure Monitor. In the coming months, you will see additional services emitting data through Azure Monitor. Based on your feedback, many service teams are considering enriching their telemetry by adding more metrics and logs. You can also expect to see richer alerting, auto scaling and log routing experiences become available. Before we sign-off, here is a quick overview of Azure Monitor. To learn more, please refer to Azure Monitor overview and continue to voice your feedback.